"I suppose I'm as guilty as everyone else in the family of always having taken Philly for granted. I remember them saying his mind stopped growing when he was five, and I guess I always accepted that." 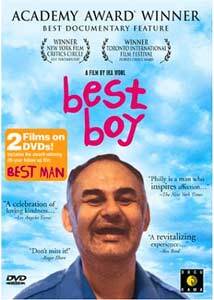 Director Ira Wohl claims to have had the idea for the documentary Best Boy after attending a family gathering, and wondering what would become of his gentle 52-year-old mentally handicapped cousin Philly—who still lived with his elderly parents—when the inevitable day would come when they could no longer care for him. Wohl, aspiring filmmaker that he was, not only took it upon himself to help Philly begin his first ventures into the outside world to gain more independance, but was there to document it in all of its innocent sweetness and agonizing sadness. When he selected Philly as the subject for the film I'm sure the last thing either Wohl could have imagined was that the project would eventually net an Academy Award for Best Documentary Feature. Best Boy spans three years in the lives of the seemingly eternally happy Philly and his family, as Ira Wohl follows his cousin attending a "training school," which not only immerses him socially with other mentally handicapped individuals, but does what it can to instill its students with whatever degree of independence, fleeting or otherwise, that it can. It is absolutely heartbreaking and profoundly endearing at once to watch Philly attempt to do the simplest of things (count, recite the months), but he does it all with such an unwavering enthusiasm that it is difficult to not smile along with him. As much as Best Boy is essentially about Wohl's cousin, easily the strongest and most emotional moments come from the lingering shots of Philly's aging parents Pearl and Max, who have truly endured much in the raising of their son, and it is possible to read just about every mix of exasperated love and parental frustration on every line of their wrinkled faces. At one point Pearl wearily intones, "If God wants to punish someone, he should only punish them with retarded children. It's such a heartache, you don't know. No one should ever know." When Pearl makes that statement it is rather startling, and it really comes out of nowhere; it is uttered with the kind of unending weariness that most of us will, thankfully, never know. Ira Wohl tells Philly's story simply, using minimal narration, instead allowing the individual segments (a visit to the doctor, a trip to a restaurant) to speak volumes. I suggest that you pay very close attention to Pearl and Max, who often appear in the background while Philly bounds around like an overgrown 5-year-old, because Best Boy is ultimately steeped in 52 years of a selfless kind of sacrifice (whether right or wrong) that will truly break your heart. Image Transfer Review: Presented in 1.33:1 format, the source print for Best Boy hasn't aged that well, and is peppered with recurring specks, soft, faded colors and heavy grain. Some sequences look noticeably worse than others (especially some interiors where lighting was less than favorable), but not awful for a hand-held documentary made over 20 years ago. Audio Transfer Review: Audio is provided in what is billed as 2.0 stereo (but seems more like two-channel mono), and while tolerable and discernable, is extremely flat and a bit on the harsh side. If you're looking for a high-fidelity experience, this won't be it, but the presentation is more than suitable for the material, and it relays the emotional punch as fine as any DTS mix ever could. Extras Review: Ira Wohl's 1997 followup documentary that takes a look at Philly Wohl twenty years after the events of the original film is included on Disc 2, and it is entitled, appropriately enough, Best Man (01h:26m:27s). Not nearly as emotionally gutwrenching as Best Boy, but certainly nearly as joyous in its spirit, this sequel of sorts at the very least delivers the immediate answers that most viewers probably had on their mind after seeing the first film. What happened to Philly? How did he adjust? One of the biggest curiosities and odd parallels that I found here is not so much finding out what has happened to Philly, but how much his older sister Francis has literally morphed into a virtual carbon copy of her own mother. On its own legs, Best Man is not as completely moving and powerful as Best Boy, but having it available on this two-disc set will allow you to immediately get the answers to the questions left at the end of the first film, without having to wait 20 years. In addition to the usual batch of Docurama trailers, along with an Ira Wohl bio, each film is cut into a manageable 12 chapters; neither offer any subtitle options. This two-disc set from Docurama offers up both of Ira Wohl's documentaries, made twenty years apart, about the life of his 52-year-old mentally handicapped cousin Philly. Best Boy, which earned an Academy Award for Best Documentary Feature in 1979, is the jewel here, full of moments brimming with parental sacrifice, raw emotion, and poignant mortality, all balanced by Philly and his wonderfully simple outlook on life. Whether Wohl intended to or not, the questions raised about the way Philly lived his life prior to the making of this documentary are achingly painful to consider when all is said and done.